Prodew can help with all your water filtration needs, from a single display case to the whole store. A reverse osmosis (RO) water filtration system is the most effective and most economical way to provide your home or business with great tasting, quality water. Reverse osmosis systems produce clean water by passing it through a membrane to remove impurities, contaminants, chemicals and solids. Our RO systems also remove 97% of minerals and 99% of bacteria and chlorine. 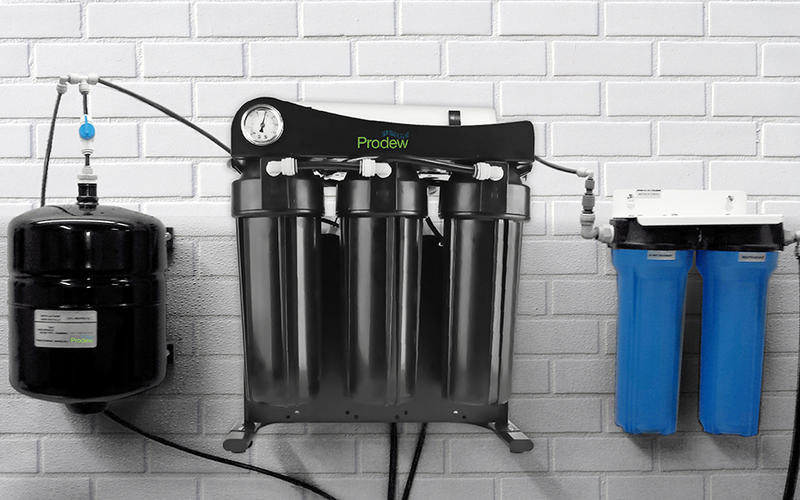 Prodew RO systems are perfect for use in commercial, industrial and household applications, and especially beneficial for supermarkets, restaurants and coffee shops. Our systems are efficient, compact, quiet, environmentally-friendly and lightweight. NeutraScale Anti-Scalant is a great way to protect your investment. It prevents nozzles from clogging, protects pipes, prevents mineral build-up and reduces energy consumption. Our systems are designed to eliminate scale, a white chalky buildup of calcium minerals that occur as the water precipitates. Over time, without the proper treatment, scale and other contaminants can build up and reduce the flow of your system, which can lead to loss in production and money. It's important to invest in an efficient anti-scalant system to remove dangerous contaminants from the water and save money on costly repairs.